What do Beagliers look like? In a short sentence, adult Beagliers look like a Beagle puppy that is a bit smaller than an adult Beagle. Of course to leave it there would be a huge disservice to this wonderful breed. They do have a look that is all their own, being the hybrid of the Beagle and the Cavalier King Charles Spaniel. There is no set standard for Beaglier breeders to try to emulate like the traditional breeds. A standard is the ideal ‘look’ that a dog of a particular breed should have. Essentially, a standard is a set of drawings that traditional breeders compete at dog shows to get closest to in a dog beauty contest! To put it in a human context, imagine a beauty pageant where every contestant had to look like an airbrushed image of the same person! A breed standard will set out things like the size and shape of physical features from the tip of the nose to the tip of the tail and everything in between. Some of these requirements will be definitive such as ‘a height of no more than 30cm’. Some of the requirements will be open to interpretation like ‘the coat should have a good amount of curl’. And some requirements are pure fashion such as banning any white markings on the dog. Designer breeds such as Beagliers have no need for one of these standards as their breeders do not take part in dog shows. The absence of a breed standard for Beagliers and other designer breeds has worked in their favour. Breeding the perfect looking dog has little relevance to Beaglier breeders since there are no dog shows to attend. 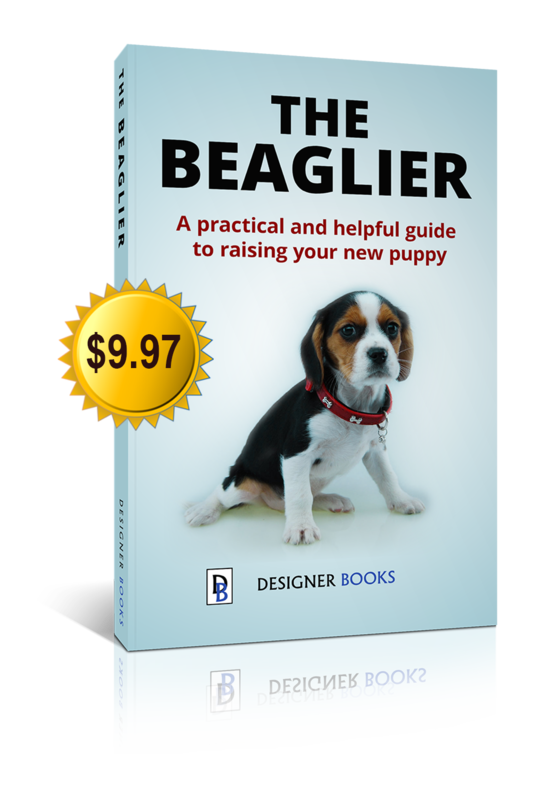 The main goal of reputable Beaglier breeders is to breed healthy companion dogs that have equally great temperaments. While this should be the goal of every breeder of every dog breed, sadly this is not the case. Many breeders of traditional breeds will still breed dogs that more closely match the standard (that have a better chance of winning show ribbons), rather than the healthiest dogs. What is the typical appearance of a Beaglier? Although there is no breed standard for Beagliers, there are some characteristics of its appearance that are very common in first generations. We use the F1 or first generation Beagliers to describe the breed as these are the most consistent of the generations. One of the most distinctive physical characteristic of this breed is its glossy coat. This coat truly represents aspects of the coat of both the parent breeds. Beagliers have a high gloss coat, similar to the Cavalier King Charles Spaniels but it is usually short like the coat of a Beagle. Some Beagliers will have a longer coat but regardless of coat length, it has a soft feel to it. The body of this breed is shorter in height than the average Beagle, but is often longer from head to tail thanks to the influence of the Cavalier King Charles Spaniel. They retain a robust body type that makes them ideal playmates for children, being able to handle boisterous games better than other small breeds. They are fairly well muscled and their chests feel solid when patted. Beagliers have a straight back and when looking a the dog from above, should tuck in at the belly. These dogs are prone to becoming overweight or obese, so an adult dog that looks like a sausage needs to go on a diet! The tail is set moderately high, with a slight curve and a slight brush. Beagliers often have darker facial colouring when compared to the marking on their body, with tricoloured and black and tan dogs having distinctive tan eyebrows. Their muzzle is a medium length and well rounded that is like a longer version of the Cavalier’s. Most have a scissor bite, but slightly overshot or undershot jaws are common as a result of the influence of short faced Cavalier King Charles Spaniels in their background. They normally have a black nose, regardless of the coat colour. Some dogs have a nose with patches of pink and black called a ‘butterfly nose’. This is where the nose that starts off pink in all Beagliers does not fully colour to black. This is a trait that is passed down from their Cavalier parent. They have large pendulous ears that are usually set well above the eyes and hang below its chin. Their large ears and soft rounded muzzle give them their ‘puppy dog look’ even as adults. The neck is a medium length that has good muscle to hold it’s head. Beagliers have large, expressive and soulful eyes that are brown or hazel colour. As very young puppies, Beagliers can seem to have blue eyes, but this is due to their young age and the blue hue of their eyes will disappear as they get older. When in motion, a Beaglier moves freely without any obstruction thanks to their straight-boned fronts and muscled hindquarters. They have a natural motion and should not look stifled or restricted. They have good reach of the front legs and good drive from the rear to make them great running partners for family members who like to go for regular runs. A Beaglier running at a moderate pace looks as though it needs little effort. The size of a Beaglier can vary a little depending on the size of the parent dogs. Obviously, 2 small parents will produce smaller Beaglier and vice versa with larger parents. Still the usual sizes for Beagliers are between 30 – 33cm tall at the shoulder and weighing between 7 – 11kgs. Some individual Beagliers will fall outside these ranges, being slightly larger or smaller than the usual size.